Hester (Griffith) Kirk was a preacher's daughter. At least that's my working hypothesis. Turn the volume down on that Dusty Springfield track, and let me tell you why I think so. Hester Griffith was my third great-grandmother. She married James Kirk in Ohio in about 1851 (sadly, their marriage record was likely destroyed in Licking County's 1875 courthouse fire). They moved to Polk County, Iowa in the spring of 1858 and raised a family of eight children. 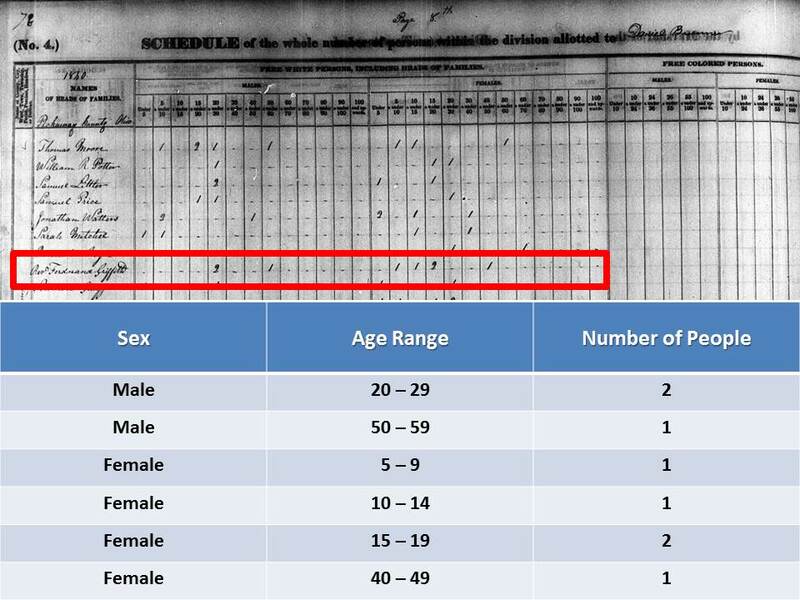 Tracing Hester's parents quickly ran into the roadblock we see for many women in pre-1850 American censuses. They're not enumerated by name unless they were a head of household. I wasn't finding Hester with her parents. Hester's first known appearance by name was in the 1850 census. She was 22 years old; born in about 1828 in Delaware. She was living with Nathan and Eliza Dodd. Nathan worked as a cooper and, just like Hester, was enumerated with $400 in "Value of Real Estate Owned." Who were Nathan and Eliza Dodd? 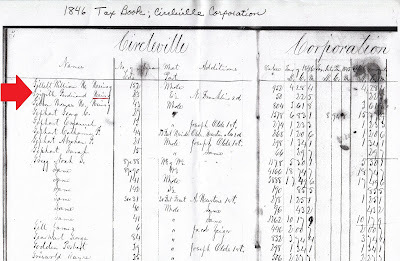 Nathan's occupation immediately struck a chord because Hester's soon-to-be husband, James Kirk, was also a cooper in 1850 (but in Licking County about 50 miles northeast of Pickaway County). An 1880-published biography of James Kirk recalled that, "While young, he learned the cooper's trade..." Did James Kirk meet Nathan Dodd through their shared profession? Perhaps James, who was ten years younger than Nathan, was apprenticed to him? I believe barrel-making is how James met Hester. But still, what was the relationship between the Dodds and Hester? My initial guess was that Eliza Ann Dodd, who was born in Maryland in about 1820, was a sister to Hester. 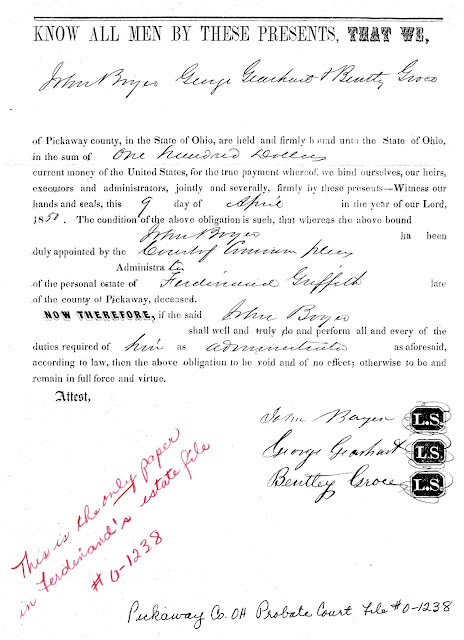 A March 1849 marriage record in Pickaway County, Ohio provided supporting evidence in the form of a surname match. Nathan Dodd married Eliza Ann Griffith. Was Hester living with her sister because their parents were deceased? Did Hester and the Dodds both have $400 in owned real estate because they inherited it from a probate settlement? That's where I left the case for a couple years. I set Hester aside and turned to other genealogy research. In December 2016, I received an email from a researcher who stumbled onto my blog. The message was to the point: "I may have some information of value to you. I believe I have established the parents of Hester Griffith who married a Kirk." If that doesn't win you over to the value of blogging your family history, nothing will! During our correspondence, I learned that she was researching her fourth great-grandfather William Banning Murphy. In the course of her research, she came across an 1814 land record that was recently digitized by the Maryland State Archives. 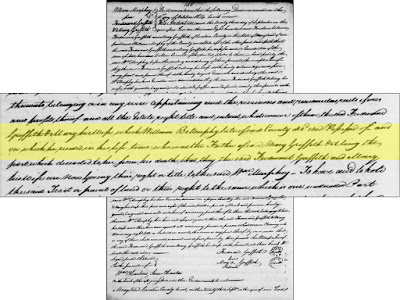 The deed recorded William Murphy Jr, son of William Banning Murphy, paying $200 to Ferdinand and Mary Griffith in exchange for "their right of that tract or tracts or parcel of lands lying..." in Dorchester County, Maryland. Having linked Ferdinand and Mary Griffith to her Murphy family, the researcher began stitching together their movements. 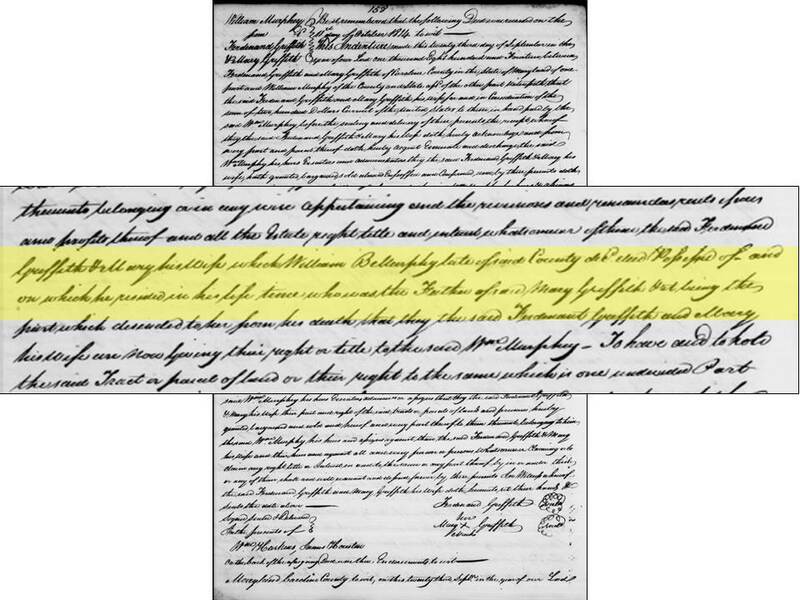 She wrote, "Ferdinand Griffith was the trustee for a Methodist Episcopal Church in Federalsburg, Caroline Co, MD in 1815; he was a preacher at a Methodist Church in Kent County area of DE in 1820-1830 time frame; and he was a minister in Pickaway, Ohio by 1840." Eliza Ann (Griffith) Dodd was born in Maryland. Hester (Griffith) Kirk was born in Delaware. Both Griffith women were living together in Pickaway County, Ohio. Who was Ferdinand Griffith? He didn't appear in the 1850 census, but he was in Pickaway County, Ohio in 1840 along with seven other unnamed individuals in his household. I assume the Reverend Ferdinand Griffith was the male aged 50 to 59. Born in about 1828, Hester Griffith would have been around 12 years old in 1840. There was a girl enumerated between the ages of 10 and 14. Was that Hester? 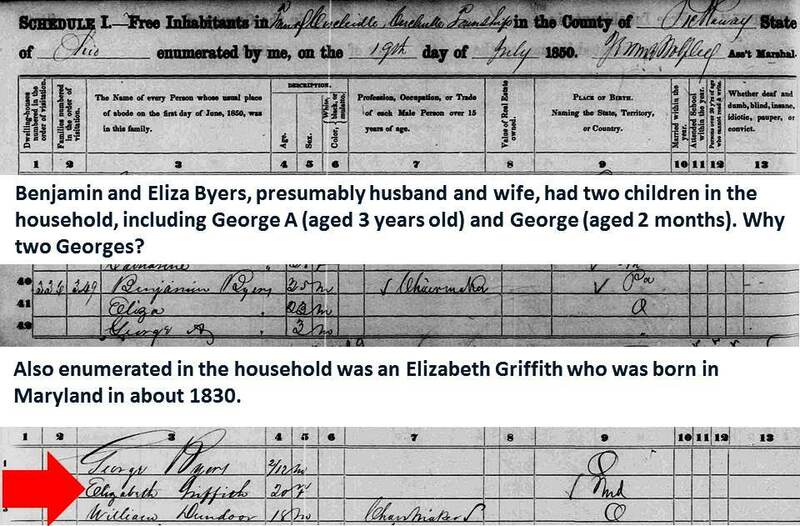 Eliza Ann Griffith would have been about 20 years old in 1840. There were two women enumerated between the ages of 15 and 19. Was one of them Eliza Ann? But look at the size of that household! There were eight people. Was it not only possible that Hester and Eliza were siblings, but that they had other brothers and sisters? 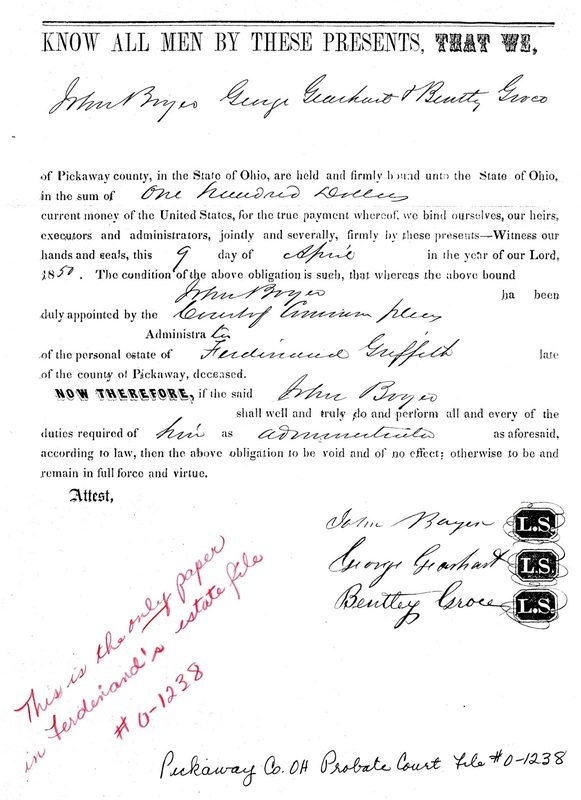 A general search of census records turned up another single female Griffith in Pickaway County, Ohio. 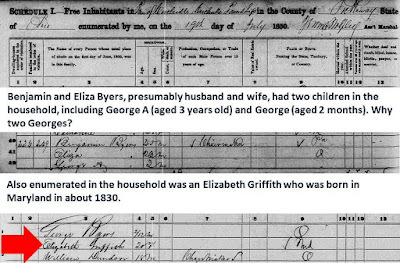 Elizabeth Griffith was living with Benjamin and Eliza Byers and two children both named George Byers (one 3 years old and the other 2 months). Was this single Elizabeth Griffith a sister to Hester and Eliza Ann? Born in about 1830, she would have been around ten years old in 1840. 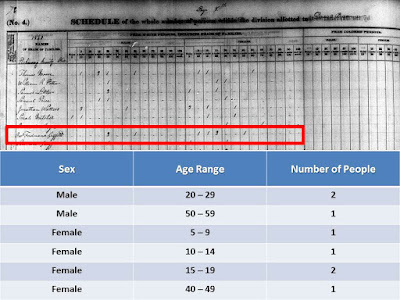 Jumping back to Ferdinand's 1840 household, there was a female enumerated between the ages of 10 and 14, which I initially pinpointed as Hester, but there was also a female between the ages of 5 and 9. Was Elizabeth that child? Without exact birth dates it's difficult to assign precise ages, so we'll put a pin in this question for now. I returned from vacation to a package from the Pickaway County Historical and Genealogical Library. A fantastic researcher had dug into the Griffiths, and found mention of the family in the minutes of Leader's meetings from the Community Methodist Church in Circleville. The minutes established a timeline for Ferdinand, and - by proxy of mentioning Eliza, Hester, and Elizabeth - brought the cast of characters together, strengthening the case that they were likely family. September 20, 1838, "On motion, it was resolved that Ferdinand Griffith and Eliza Ann Griffith be put into George Bruner's Class." October 17, 1838, Ferdinand Griffith was one of the "Local preachers" present for a leader's meeting. December 6, 1838, Ferdinand Griffith was one of the "Local preachers" present for a leader's meeting. 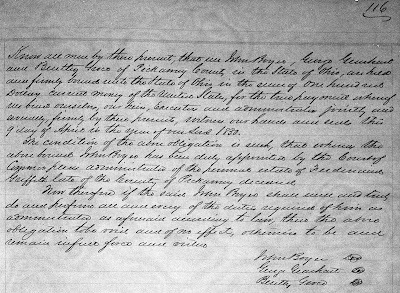 December 6, 1838, "On motion, resolved that Ferdinand Griffith and Mary Griffith be put in William McArthur's Class." Is this Mary Griffith Ferdinand's wife? December 6, 1838, "On motion, resolved that Eliza Griffith be put in Jason Case' Class." March 25, 1840, "The following persons were then received on probation to wit:...Elizabeth Griffith...Hester Jane Griffith..." That's the first mention of my third great-grandmother, Hester, and with her middle name! June 8, 1844, "The Leaders Meeting was opened with singing; and prayer by Bro. F. Griffith." August 24, 1846, "He [Rev Wornock] also reported that Elizabeth Griffith and William Greenleaf had been laid aside for neglect of class." 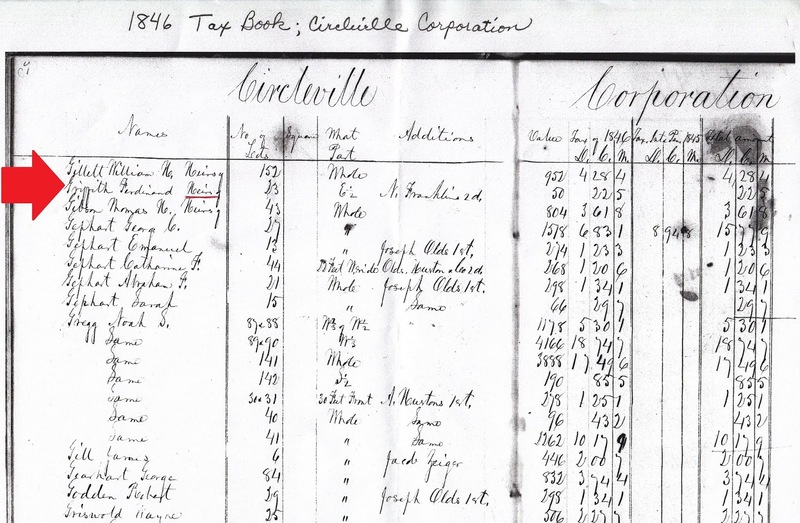 The Pickaway researcher also found mention of Ferdinand Griffith in the County's 1846 tax book. The entry listed "Griffith Ferdinand Heirs of" having paid 22.5 cents in tax on lot 23 in Circleville, which was valued at $50.22. Ferdinand had passed away sometime between when he delivered the opening prayer at the church leader's meeting on June 8, 1844 and 1846 when his heirs paid property tax. I need to investigate whether there are other tax or land records that can help narrow this timeline. There's also a perplexing question regarding Ferdinand's probate file. Except for a letter of administration, there are no other records overviewing the estate's settlement. Nothing to name heirs. 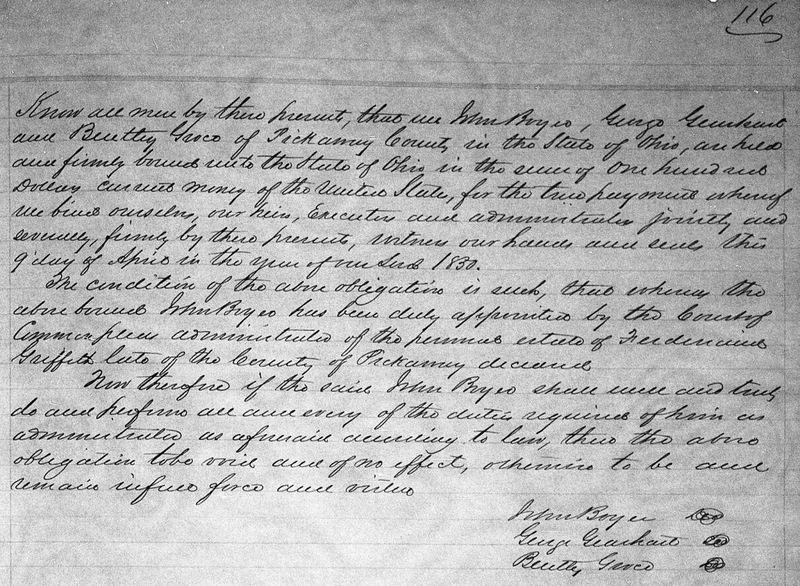 Oddly, the letter of administration is dated April 9, 1850 - four years after Ferdinand's heirs are listed on the property tax record. Why would it take so long for an administrator to be assigned? Also, what does the name of the administrator look like to you? Is it John Boyce? Bryce? It's not Byers, right? There's a lot of circumstantial evidence that brings Ferdinand and Hester into the same orbit, suggesting that they were father and daughter. But none of the records say it explicitly. Could DNA help tip the scales and provide greater certainty in answering this question? The Murphy researcher who first reached out to me in 2016 had not yet taken a DNA test, but opted to do so. While we waited for her results, I began trawling through the Ancestry database to see if I could link any of my kits to known descendants of William Banning Murphy. Sure enough, I was able to surface three matches to people who descend from William Banning Murphy's son William Murphy Jr (the same man who was party to the deed with Ferdinand and Mary Griffith). All three Murphy descendants were genetic matches to a single kit I administer for a woman who is a great-granddaughter of Hester (Griffith) Kirk. 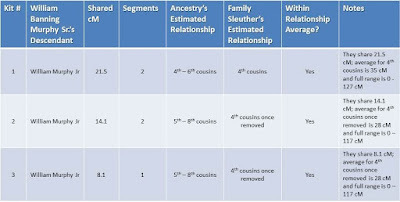 The amount of shared DNA and projected relationships between the kit I administer and the Murphy descendants were in alignment, based on Blaine Bettinger's The Shared cM Project, with what I would expect to see if Hester (Griffith) Kirk was a granddaughter of William Banning Murphy. The DNA evidence seemed to support the theory that her mother was Mary Murphy who married the Reverend Ferdinand Griffith. As a cherry on top, the DNA results recently came back for the Murphy descendant who first alerted me to Hester's likely parentage. Sure enough, she was a match! 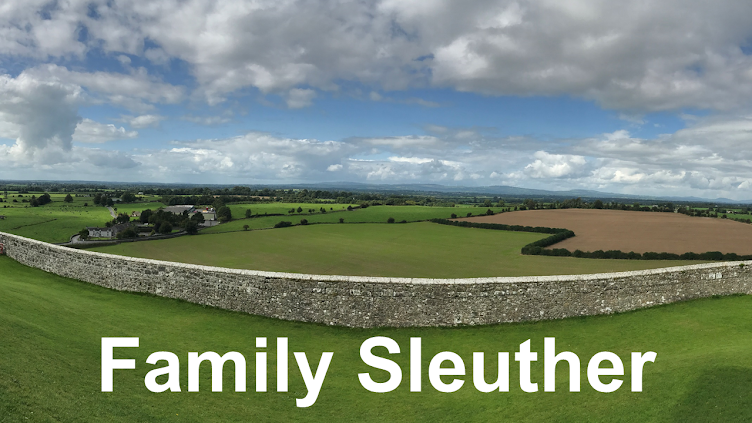 Although the search for additional records continues, the preponderance of evidence strongly suggests that Hester (Griffith) Kirk was the daughter of the Reverend Ferdinand Griffith and his wife Mary Murphy. I feel confident that I have found my fourth great-grandparents. I would look into the name Byers being possibly spelled Bayers. In the Letter of Administration (both versions) if you take a closer look at the handwriting you'll see, for example, the a in dollars (at top) and State (bottom) is not closed. 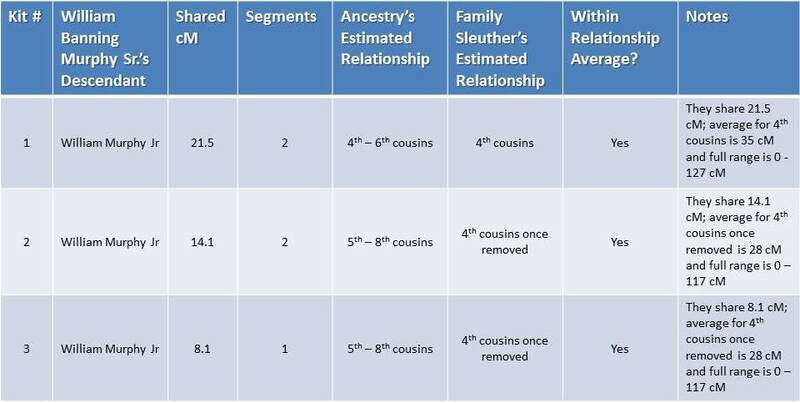 Kudos to the cousin who reached out to you and congrats on the DNA matches! Thanks for the recommendation, Cathy. I'll take a closer look. I was initially curious if the name on the letter of administration was the same family enumerated with Elizabeth Griffith in 1850. Never any shortage of web to untangle.! What great teamwork! I am always impressed by your research and how you use both traditional research and DNA to strengthen your conclusions. Nice work! We're so fortunate, as genealogists in this day and age, to have this science and digital resources available to us. We're able to piece history together that before would have been near impossible. In the clerk's version of the signature, it looks like John Boyer(s) to me. I research the Boyer family in southwest Pennsylvania, so I could also be seeing things. It might be possible to find his original signature on a document in the probate packet, although sometimes people reserve their most casual handwriting for their own signatures. As I look at the signature again, Marian, I agree with you. It does look like Boyer. Definitely not Byers, which I was kind of hoping for given that the Elizabeth Griffith was enumerated with a Byers family. Thank you for weighing in. I appreciate it.